This volume sets out to examine the history of Ireland in the years following the Dail's ratification of independence from Britain in 1922. 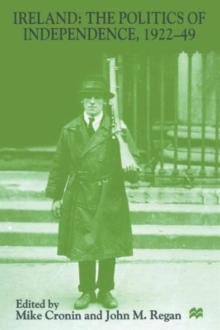 The different authors in the collection, all experts on different aspects of Irish history from the first half of the twentieth century, focus on a wide range of different themes. Considerations of the decline of Redmondite nationalism, the role of Unionism in the Free State, Party structures and organisation, the development of different forms of identity, the nature of economics and the place of the newly independent Ireland within the British Empire are all included. All chapters are either the result of new archival research or else offer a sustained historiographical critique of current thinking.